When it comes to fashion, I've become pretty comfortable around my Tri Team. Perhaps too comfortable. I wear Guitar Hero boxers on my bike rides and my stretchy shorts on the runs. The gym is a different story. I don't want to draw attention to myself. I believe that whatever you wear makes a statement. For example, picture in your mind what kind of person would show up wearing a "Satan's Gym: No Pain No Gain" shirt. Now picture who might wear a shirt with cute Mickey Mouse logos on it. See the difference? I have four Disney Tri Team workout shirts. I wear them frequently, and since I do have some other plain shirts any specific Disney shirt might get worn once every 2 weeks. (they are washed after every workout.) If you saw them side by side they are very easy to tell apart; there have different trim colors and designs but basically they are all white and all have the same logo of a Mickey swimming, biking and running. So if someone were to see me at the gym frequently, someone like Joe the Trainer for example, they might always see me wearing a white Disney Tri Team shirt. They're going to remember the logo, not the trim. Here was my dilemma: did Joe the Trainer think I was wearing the same shirt 3 times a week? If he did, then I would want to explain that I have multiple shirts and wasn't being gross. If he didn't, then I didn't want to look like an idiot by bringing it up. So of course I went with the idiot option and told him "you realize of course I have many Tri Team shirts, not just one." He looked at me funny and claimed he never thought about it. I may look like an idiot, but at least I'm an idiot with good hygiene. Story 2: I showed up to the gym after work and realized I hadn't packed ANY shirt. I knew I could use an extra (non-Disney) workout shirt so I walked over to the Mall 2 blocks away and bought a new cheap one. I picked out a solid green shirt; I never used to wear green, but ever since Coeur d'Alene I've been adding CDA green to my wardrobe. I went back to the gym, put on the shirt and then put on my shorts - my solid CDA green shorts. I never checked to see which shorts I had with me. I looked like a giant pickle. The only thing worse than wearing a coordinated outfit at the gym is wearing a coordinated outfit that looks bad. I felt ridiculous. Fortunately, this was a non-Joe-The-Trainer day so at least I didn't have to explain myself to him. 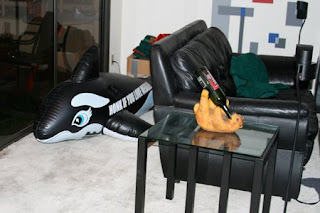 I've had a giant inflatable whale in my condo for the past 6 months. This is the whale that IronmAnnie brought to the Cali Half last year and to Ironman Coeur d'Alene back in June. She brought it over for my birthday in July and he's been wandering around the condo ever since. I don't have a lot of room in my bedroom, so he mostly hangs out behind the couch. I had some people come over for Christmas and I thought it was finally time to clean up the place and deflate him. But I couldn't do it. At first I felt that I needed to preserve the genuine Idaho Ironman air inside, but then I realized IronmAnnie probably deflated it before taking it on the plane. It's not like I'm throwing him away, I could blow him back up any time right? But I can't. I just really like him and I think it would make me sad to see him shrivel up. I can just imagine him looking up at me as the last bit of air leaves his body, trying to understand why I would abandon him like that. So it looks like he'll be sticking around for a while. At least he matches my black couches. I had a group ride today, and one of us had a flat. Three of us, using three different CO2 cartridge valve thingees couldn't get the tire to inflate. I don't know if it was a bad valve on the tire or what, but the cartridges weren't doing the trick. I took my mini-hand pump off my bike and pshh-pshh-pshh-pshh-pshh; pumped up the tire with no problem. My Senior Vice President got me in big trouble. Apparently, last year Mr. Pusateri participated in the "2008 Great Weight Loss Challenge". I have no idea what that it is, probably a company-internal diet program. Good for him. And I guess two weeks ago, the sponsors of the program sent out magnets to all of the participants via large inter-office envelopes. "You think I need to lose weight?" Now keep in mind that Annie is getting married later this year and all psycho brides think they need to lose weight anyway. But they don't want to be told that. Even if you didn't know you were telling them. I'm not sure, but I don't think Joe The Trainer likes me. Sometimes I'll look around and see other clients with their trainers and they'll be.... chatting. They'll be sitting on a machine, possibly talking about exercise but not necessarily. The point is that no actual exercise is taking place. Joe The Trainer never chats with me. There isn't time; we never stop moving. If I want to say something, I have about 15-20 seconds when we're moving between machines. When we move between floors, I get 45 seconds. If I want to have a longer discussion, I have 3 minutes while I'm on the Stairmaster. I can speak, or save my breath. The choice is mine. But chatting? No way. He won't allow it. Actually, this is one of the reasons why I think he's a great trainer. I see how other people move around and what we do in one hour would take them 90 minutes or 2 hours. 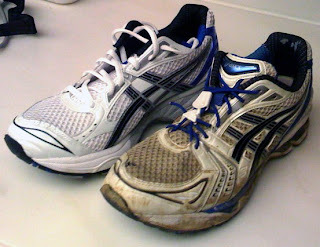 Trainers are expensive, and a good one won't let you waste 10 minutes chatting about your weekend. And yes, after the workout I can talk with him all I want. But by then I usually just want to get the hell outta there. I think some day I'll put on a fake moustache and glasses, go to the gym in disguise and spy on Joe The Trainer when he's with another client. I bet they go into the Yoga room and play Guitar Hero for an hour. I started running again on a regular basis. Ow. My first run Wednesday was supposed to be 5.5 miles with a big hill in the middle, but a nice leisurely pace. Unfortunately we got a bit over-eager and went out a little too fast. That hurt. On Thursday, we were supposed to a flat 4 miles, at a nice leisurely pace. Unfortunately, I got a bit over-eager and went out a little too fast. That hurt even more. The cool part of the evening was that while we were stretching in the lobby before the run, Wayne Knight walked by. No idea what he was doing in the building, but he didn't join us. To answer Jill's question, I wouldn't call him "skinny" but he definitely smaller than he was in his Seinfeld days. The Wednesday and Thursday running groups essentially pull from the same pool of people and there is a lot of overlap, but there is definitely a different vibe to them. The Wednesday group tends to be cyclist-oriented, while Thursday is more runner-oriented. What's the biggest difference between the two? Cyclists wear tight, clinging clothing; runners wear loose, flowing clothing. And I found out the hard way that it is apparently a fashion faux-pas to show up on Thursdays wearing spandex. Run-Leader-Leah brought this to my attention by announcing to the group "so, Wedgie's showing up with the Tri shorts!" Ironically, she was explaining to the new people that we would have several distances and paces, so everyone would feel comfortable. Yeah, I felt real comfortable with everyone turning towards me to look at me bum. So 2009 is off to a shaky start. I figured I would be smart and force myself to do a bike ride new years day. I went to a New Years Eve party with the specific plan of getting a ride home and leaving my car there overnight. That would force me to ride about 15 miles the next day to pick it up. Not a long ride, but at least it would get me started. I also made a conscious effort not to over-indulge on snacks at the party, to start my diet a day early. Here's the problem: if you cut back on your food intake, you need to cut back on your alcohol intake. I did not. I was fine at the party, but the next morning I was... um... "drafting in the porcelain transition zone". It was awful. Thought. I. Would. Die. To make matters worse, my "abs" (don't have any yet) were still sore from the last session with Joe The Trainer, so it hurt extra every time I hurled. I never got dressed New Years Day, never left the house, didn't get my car until the following day. Click on the photo to see a list of just some of the problems with the photo.